I can not decide whether to take my little poodle with us? If you know hotels in Rome and surroundings is allowed to stay in with little dogs I'd love to know too! היי חברים! מה שלומכם? רציתי לאחל לכם שבוע נפלא ולשתף אותכם בתמונות שצילמנו ביום שישי! אנחנו התחלנו לתכנן את הטיול שלנו לאיטליה, אתם זוכרים שזכיתי בכרטיס טיסה לרומא נכון? חשבנו להשאר ברומא ליום אחד ואז להמשיך לטייל מסביב לרומא. אני אשמח לקבל המלצות וטיפים :))) אני מתלבטת אם לקחת את הפודלית הקטנה שלי איתנו? אם אתם מכירים ביתי מלון ברומא ובסביבה שמותר להתארח בהם עם כלבים קטנים אני אשמח לדעת גם! Love white pants...makes the rest of the outfit so instantly chic! simple outfit.. yet brightened up by those wonderful shoes you have ! i am so happy to find another israeli blogger! you are so cute, too! just spent some time going through your blog & it's wonderful & i am beyond jealoud that you were asked to collaborate with mango. Miyan thank you!! Add me in facebook and be in touch! J aime !!! Bon look!!! how exciting!! i love Rome. im not sure about which hotels allow you to take dogs with you but im sure there will be a lot of them. 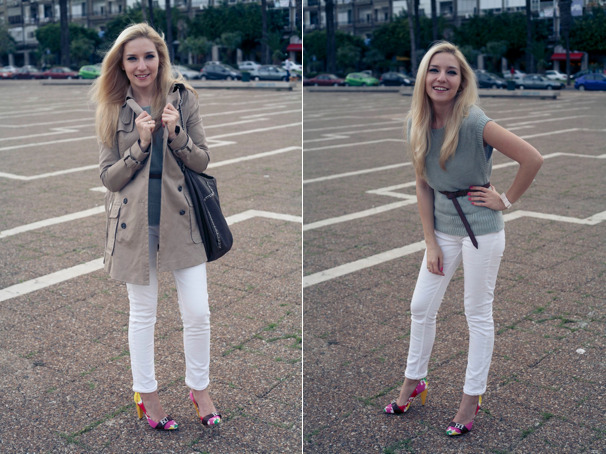 i love your blog, you are gorgeous and i love your shoes! You lucky girl, Rome. I love your grey sweater blouse. That first picture is my favorite! You look very beautiful! I love Italy! Especially Toscane! I loved this pics, your look is very nice! Very great shoes! Thanks for visiting my blog. From now I'm following your. FOllow back if you like. those shoes are just too cute! love! I love your shoes! I'm a great Miss sixty fan and the shoes are amazing! Lovely outfit! You have a new follower, hope you'll follow me back, would be a pleasure!